Previous related posts: I, II, III. I finally ran out of my (discontinued) Sure Soft Solid supply. It lasted me a little over a year. While you can still find both Sure Soft Solid and the replacement Sure MAX online, they are terribly expensive. At brick-and-mortar stores I couldn’t find either one. Not at HEB, not at Walmart, not at Walgreens. What I did find at Walmart was a single lonely Old Spice Red Zone High Performance Solid bar, the one mentioned by Moi in this comment – he wasn’t lying after all. It was the “after hours” smell. Whatever that means. Same parent company, same ingredients, but the smell… I already feel more manly. What channel, what time? Is it as good as beach volleyball? Que cagado! Por mucho tiempo utilicé Old Spice, pero el de Gel y me funcionaba mas o menos bien, pero a veces me irritaba la piel. Así que decidí ensayar Speed Stick que igual funcionaba un poco menos bien que Old Spice, pero no me irritaba. En el viaje a Australia me llevé uno de esos y se me acabó entonces compré el más barato: Lynx cuyos comerciales son como los de Axe, donde las mujeres hermosas se te tiran encima. El desodorante era malísimo, pero al principio pensaba que era porque como turista te lo pasas caminando todo el dia. 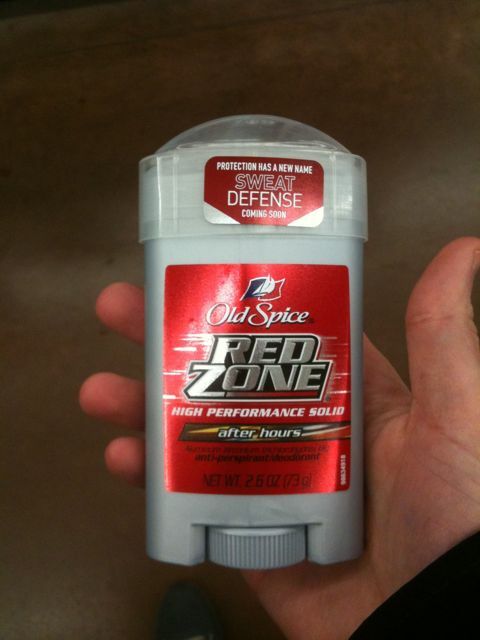 Pero luego en Austin me di cuenta que en verdad era malísimo y compre un Old Spice Red Zone High Performance Solid bar que fue el primero que agarré en un HEB y me ha funcionado estupendamente. Any luck finding an unscented equivalent? Here’s what I found. Very similar @ CVS – Secret clinical hypoallergenic sensitive skin advanced solid. Good call, seems to be the same/similar. But pricy, smaller stick, sometimes hard to find…seems like we’ve been down this road before. A nice wide stick, easy on, disappears when applied, keeps you dry…what’s not to like? It’s a Unilever product, not P & G. It’s pricy–$9 for 1.7 oz. It doesn’t come in unscented, but it goes on clean and this scent is pretty neutral. Good stuff!